Time for the Ultimate Hunting Vehicle to get naked! When I had my first Jeep Wrangler I royally jacked this up, thanks to impatience and the wonderful world of interwebs experts. 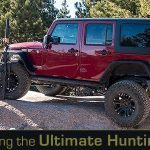 Here in part four we’ll show you what might be the best $400 – $600 you can invest in your Ultimate Hunting Vehicle (UHV) Jeep. More on that in a moment, first let’s see how we got here. In Part 1 of the Ultimate Hunting Vehicle story we talked about the versatility of the jeep platform – it is the AR-15 of the vehicle world. Then we showed you how you can build up the suspension, maximizing it for hunting anywhere from the dirt fields of West Texas to the high country of the Rocky Mountains. In the process, the UHV also got a lot better road manners. In Part 2 we showed you a sweet overhead gun rack that is available for trucks, UTVs and the most versatile of all, Jeep Wranglers. On the Wrangler there’s almost no installation effort so you can readily put it in or take it out. It’s like the old Almond Joy and Mounds commercial: Sometime you feel like a nut, sometimes you don’t! When it came to Part 3 we addressed recovery, both for your own Ultimate Hunting Vehicle and the animals you’ve successfully hunted. Whether your UHV is a truck, a UTV, buggy or Jeep you need a winch, but probably not the same one a rock crawling rig runs. We’re not trying to build one of those. So now let’s get back to the topic at hand, getting naked. Not only is it a ton of fun, but it’s a unique experience pretty much limited to Jeep Wrangler owners. Correction, Jeep Wranglers. “Naked” refers to a Wrangler that has neither top nor doors. It’s the ultimate in visibility and fun. Not coincidentally, it opens up new options for a variety of hunting adventures. For example, blasting across wheat fields thinning herds of hogs (correctly called “sounders” but not as much fun to say!). It’s a lot like helicopter hog hunting but you’re still on the ground and it’s a lot cheaper. You get to be the door gunner! Or, how about mounting a gun to the roll bar for some longer range prairie dog sniping? Yeah, we’re working on that with the inventor of the ZRODELTA DLOC mount! Sadly, it gets worse. Perhaps, like some of you, I got the urge one weekend to pull the top off my first Jeep, at that time a four door super charged wrangler. I soon realized a hoist hanging from my garage roof would be perfect. No hoist was available locally so I consulted the interwebs for advice, of which there was plenty. Lucky for me, I already had a $100 electric winch for lifting, some saws, hammers and foolish determination. Another $250 at Home Depot for supplies and I was ready to go. Long story short, hours and hours and hours of effort later (complete with abusing a friend I recruited to help), I pressed the button on the winch remote and my abomination of a hoist came to life. It actually sort of worked. But it was so bad I only used it once ever, and worried that my top was being damaged the whole time it hung. Which is why I gave up and put the top back on about eight hours after it came off! So now I have wasted a weekend and $350 on a DIY jeep top hoist that I left as a white elephant gift to the family who bought that house. I may still have a flat spot on my forehead from beating my head against the wall. Drama free Wrangler top lifting installed! Final installation. Fast forward to this Ultimate Hunting Vehicle series. Obviously we have to be able to remove the top without all the drama for the Jeep Rubicon to bear the title “UHV”. And thanks to our friends at Extreme Terrain we’re not even considering a repeat of the DIY Disaster. Instead, Extreme Terrain sent the ultimate solution, the Lange Power Hoist-a-Top. It’s $400, already proven and ready to install in your garage. Perfect, right? Wrong. I’ve seen some perfect installations of this hoist that would make HGTV producers proud, but I’m not HGTV hammer swinging stud. I have some hand tools, even a power saw and average ability to use them. Maybe you can relate, and if so following instructions and YouTube videos probably seems like good ideas. They are, and you should, but they don’t quite cover all the bases. First you should know that I couldn’t find a YouTube video that mirrored the supplied printed instructions. To me, logic dictated that I go with the provided instructions where they differed from the YouTube videos. Sometimes that worked out, sometimes not so much. For example, the Lange hoist is as versatile in its mounting options as the UHV is in its hunting options. My printed instructions say that if my ceiling is higher than nine feet I can use the ceiling mount option. First installation, ceiling mount. Thought I was done, but no… Note the white foam, it looks goofy but lets you store the front Freedom panels securely on top. Perfect! It’s the simplest mounting option with the least amount of work and my rafters in the attic are running the right direction. I even reinforced the one I’d hang everything from. I’m already feeling smart and accomplished. Next I drill pilot holes in the ceiling and then place Lange’s square steel bar, bolting it in place up there. I hang the winch on the bar and power it. In no time at all the bracket that will attach to the Ultimate Hunting Vehicle top is assembled and in place. There’s not much to assemble. Man, am I excited! But as I press the lift button, I realize I’ve mounted the whole thing too close to my garage door! The door is open and sitting between my Jeep top and the ceiling! My top is hanging too low. I know I lined up everything before I drilled the first hole in the ceiling but somehow I erred. Not the end of the world, I’ll just cut a piece of 2×8 lumber I found in the garage and use it to span a couple of rafters and move winch back from the garage door. In fact, it’s better this way because I’ll split the load between two rafters. All good. Well, almost. About that nine foot ceiling part of the instructions… I’m pretty sure a 9’6” ceiling like mine would work out okay for a stock jeep, but as you know from part one the Ultimate Hunting Vehicle is both lifted and sitting on 35” tires! When I lift the top this time I find it’s about three inches too low, the bottom edges hitting the top of my back doors! Wall mounting gets the bulk of the winch out from between the hard top and ceiling. Next up, the wall mount for the winch. We move the winch back to the wall and let the cable extend to a pulley Lange included where the winch used to be. That buys back about eight or ten inches of height clearance and finally we are good to go. I back the Ultimate Hunting Vehicle into place connect the hoist frame to the appropriate three points on the top, stack the front freedom panels on top as Lange intended and grab the remote. I’m pretty sure a light shown from on high while angles sang as I pressed the “up” button and the top rose beautifully to the ceiling! The third time was indeed a charm and I’m now pretty good at this installation thing. Sure it took three times as long as it should have but at this moment I couldn’t care less! Now we can mount a gun up on the roll bar, which isn’t just crazy cool, it’s going to be fun way to hunt. Obviously rain can make you wish your top was back on. Getting that top back on used to be a nightmare, but with one hand pressing the “down” button on the remote and the other guiding the top back onto the Rubicon, it was a literal piece of cake. My wife and I stared at each other in amazement, recalling the travesty of that hoist I built a few years ago. This moment of ease is sweet! Retail on the Lange hoist from Extreme Terrain is $399.99 and I don’t know of a $400 mod that will give you both the fun of an open top vehicle and new hunting options besides this. Bang for buck, this is really good. So seriously, skip the DIY stuff, it’s just not worth it. Now that the top is off we need to remove the doors to open up hog hunting door gunner options and the ultimate open-air ride. Unless you’ve never had the doors off your Jeep Wrangler you should find this task pretty easy. But once off, what do you do with them? They are heavy and awkward, and they don’t stand up on their own. If one falls over you may well have to schedule an expensive trip to a body shop. There are all kinds of solutions from DIY (thanks, but NO!) to racks and wall hangers. The least expensive attach to a wall and doors hang from them through the window frame. That’s fine but could be hard on the window seals. Super easy, but not super secure for your doors. I consider this a garage upgrade! There’s a better way, the Barricade Door Storage Hangers also from Extreme Terrain. They attach to your wall and replicate the door frame and latch from your Jeep. You literally just drop the doors onto the hinges like you would if you were putting the doors back on your jeep. Then you close your door against the wall where it engages the latch hook. You’ll laugh at how it’s exactly like closing the door on your jeep, except the door is now hanging securely on your wall! For a four door Jeep like our Ultimate Hunting Vehicle you’ll need to by two pair at $99.99 each. A couple hundred bucks to keep your doors in good shape? Heck yeah! Remember the singing angels as the top hoisted perfectly? Well the only thing better in the project was when I timed removing the doors and hoisting the top, all by myself thank you. Twenty-five minutes at a casual pace! I bet it can all go back on in ten or so. Honestly, it’s screwing off and on the eight bolts that secure the top to the jeep that takes the most time. I don’t even use the door bolts most of the time. I love it when DIY doesn’t make sense, when you can buy something that is proven, probably better thought out and requires less time intensive labor, but still costs close to what the DIY options do. And in case you haven’t figured this out yet, I’m pretty much on the low end of DIY competency and still managed to get the Lange hoist and Barricade door hangers up and working nicely. I can’t wait to go chase prairie dogs with my naked UHV, but in the meantime I’m going to love driving it to the post office and exploring the mountains. All that fun and versatility for less than the typical price of s super cheap AR-15 is what I call a no-brainer. Are Cute Little Prairie Dogs Fun to Shoot? Is it Bad? You Tell Me. This entry was posted in Special Hunting Weapons & Tactics™ - The Center of Gravity for Tactical and Long Range Hunting and tagged Hog Hunting, Prairie Dog, Ultimate Hunting Vehicle by Jonathan Owen. Bookmark the permalink. Where can I get one,Jeep ? You can buy jeeps just about anywhere, Jerry. But maybe you’re asking where you can buy our Ultimate Hunting Vehicle? I had the Wrangler TJ and it couldn’t make it to where I was going without requiring a Jerry can there and no hope of making it back with out the gratuity of the station owner. She was just too thirsty. Now I hunt out of my Landcruiser window or out of a SXS. Really at the end of the day to have the ultimate hunting rig buy a good running old Hilux or the like and get chopping!